I’m not a mother. So for me, talking about pregnancy, babies, motherhood or parenthood in public can sometimes require the skill of a Russian ballet dancer to tip-toe through a mine-field of taboos, out-of-bounds and ‘how would I know’ topics. However, on this one, I’m pretty confident to stride through like a country Victorian full-back. The topic: gender reveal parties. This new event genre seems to be increasing in popularity in the US, and there are web articles about how to host such parties (my ‘Google’ of how to host one provided 22,500 results), ideas for what to do, news articles, and on a recent breakfast TV show in New York, they even did a ‘live’ reveal to the nation with a combination of expectant couple and baked goods. Confused? Let me briefly explain — as best I understand. Gender reveal parties are like pre-drinks of the baby shower ball. The event where you tell everyone if you are having a boy or a girl. This trend has clearly moved past the debate over if you should find out the gender before birth. There are lots of ways the ‘reveal’ can happen, such as opening boxes of balloons, but cutting a cake, wedding style, in front of party guests seems to be the ‘traditional’ way. 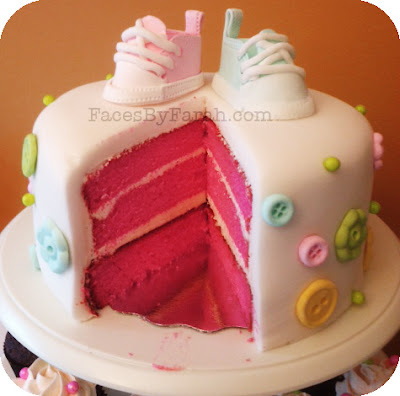 The parents cut open the baby reveal cake, and the colour of the cake inside (using one of those good old pink and blue options) heralds if the female or male head count will soon go up in the family. However, if you are the expectant parent, and want to be part of the suspense, you can ask your doctor to send the scan results directly to the cake maker. The chef will keep, er, mum on your baby’s gender while they are making the iced and frosted masterpiece, and then everyone can be part of the fun at the party. From all of the photo evidence on the internet, these parties are very popular and a source of fun and joy for people in a very exciting period of their lives. Each to their own but this ‘new’ baby/parent trend won’t/wouldn’t be for me. If for some reason I am to ever have a gender reveal party, my guests will be treated to a marble cake. It seems the perfect host for such a party has, in fact, revealed herself! Ha! I am rather well-versed on the ins and outs now.